Photo JYU/ Open Science Centre / Photo archive of Jyväskylä University Museum. Finland’s first Conferment of Degrees ceremony was held at the Royal Academy of Turku in 1643. Since then, the conferment tradition has continued in Finland without interruption and all universities have adopted the tradition in their own ways. The first conferment ceremony of the University of Jyväskylä was held in 1969. Thus, the 2019 ceremony offers an opportunity for JYU’s first recipients of master’s and doctoral degrees from 50 years ago to be recognised as riemumaisteri or riemutohtori (honorary titles awarded 50 years after the original degree). The first official conferment events in 1969 started on Flora Day on 13 May. The Conferment of Degrees Committee travelled to Keuruu to ask Armi Sakari to be the Ceremonial Garland Weaver. She is the daughter of Aimo Sakari, a professor of Romance languages. The members of the committee were Kyösti Jaakonsaari, Heikki Rusko, Kari Hokkanen, Tuovi Jokipii, and Ilkka Savijärvi. They started out early in the morning. Some remember that the group was an interesting sight when it stopped by the University café for some red lemonade. The young gentlemen were dressed in tailcoats and the young lady in a black full-length dress. Naturally, they were also wearing the student’s caps. In addition, they were carrying a magnificent bouquet of 30 roses for Sakari. 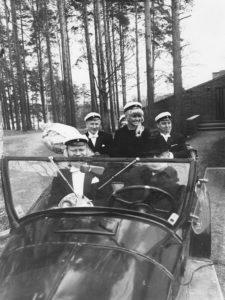 Before travelling to Keuruu, the Conferment of Degrees Committee drove around Jyväskylä in the Student Union’s museum car. The car was known as “Susanna” and the Student Union had bought her in 1960 as way to draw attention. Susanna was a Packard Six Phaeton from 1927 and the driver was Mauri Lindell. The trip to Sakari’s home in Keuruu was made with a train. Registration for the Conferment of Degrees Ceremony 2019 is now open. All master’s and doctoral degree holders who have not yet been conferred can participate regardless of the year of they completed their degree. The last registration day is on 1 February 2019.